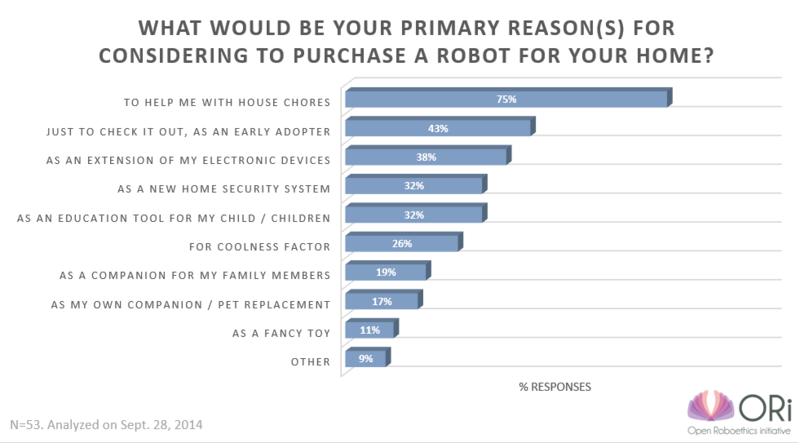 Why would you want to buy a robot for your home? When we asked our readers this question, the majority (75%) said that they’d want a robot “to help me with house chores”. In contrast, all other reasons we thought may tempt people to purchase robots received less than 50% of votes. In fact, the second most popular response was “Just to check it out, as an early adopter” (43%), which may be indicative of our reader demographics at Robohub. Maybe this is because a lot of people already own robotic vacuum cleaners, such as Roomba from iRobot. And maybe this response will change once Pepper hits the market early next year and the pre-sold 4800 units of JIBO starts rolling out to developers and people’s homes in about 1~1.5 years from now. But it’s interesting that most Robohub readers are looking for a robot to fulfill functional purposes (at least for the time being), despite the fact that a number of companies are marketing their robots as companions. In fact, only 19% of our readers indicated that they would buy a robot “as a companion for my family members” and 17% said “as my own companion / pet replacement”. Note that readers could choose multiple answers to this question (i.e., some people said that they’d get a robot as a companion for themselves, as well as for their family members). Home robots in the next five years: Will they feel like your companion? We also asked our readers about whether robots will be able to be suitable companions in the near future. Results from our poll indicate that the majority of people are skeptical about this notion. In fact, 55% of the readers said that home robots will be more like smart tools/toys/appliances than something that elicits a sense of companionship. This echoes the results from the first question that having a robot as a companion isn’t really something that majority of people would buy a robot for, nor something they think is possible in the near future. However, 33% said robots would be capable of eliciting companionship within the next five years, suggesting that while this may not be the majority opinion, quite a significant number of people expect home robots to elicit a sense of companionship in us fairly soon. Some readers provide interesting variants to the poll responses: One reader explicitly stated that s/he’d like an assistant robot, instead of a companion robot, whereas another reader indicated that the answer is somewhere between an appliance and a companion. It’s no secret that a lot of research in human-robot interaction and a number of robotics start-up projects are motivated by the possibility that robots can provide a solution to ageing demographics problem: some expect robots to provide physical assistance to caregivers / nurses so that they can care for more number of seniors; others seek to build robots that can allow seniors to live independently, rather than in senior homes. Meanwhile, a number of academics have been advocating the field to approach this with caution (e.g., Drs. Amanda and Noel Sharkey wrote about this topic in 2010, followed by many others), while some research has been dedicated counter cautionary tales by demonstrating positive effects of introducing robots to senior population. We were curious about how receptive our readers are about having a personal robot for members of the family, including elderly members. 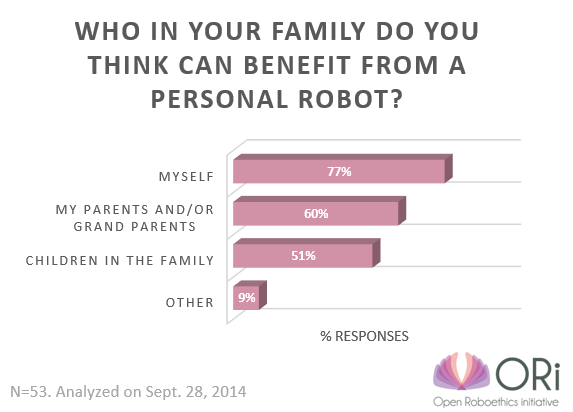 When we asked which member of their family they think can benefit from a personal robot, 77% of our readers indicated that they themselves would benefit from it, while 60% said their parents/grand parents would benefit, and and 51% said their children would. Those who voted “other” indicated that their significant others, or their pet(s) could benefit from having a robot at home. This is positive news for start-ups and researchers looking to develop robots for the elderly population. In general, people are receptive to the idea of robots for their parents/grand parents, although less receptive to the idea for the children in the family. As home robots become more commonplace, it will be interesting to see how our acceptance of home robots change. For now, the members of the Open Roboethics initiative will work to capture the state of your opinions on the topic of robots for home and for care. That being said, if you’d like us to cover a specific poll, perhaps a case study or a topic within the ‘robots at home / for care’ context that you’d like to get our readers to discuss, please let us know. We’d love to hear from you.